-Glass is a great container for herbs (mason jars are what I use) and can be recycled from soups, canning, and certain food products. The largest benefit is they do not leach plastic by-products, like plastic bags or containers do. Another benefit is creating a tight seal and not allowing oxygen or moisture to enter, minimizing oxidization or mold on the plant material which will drastically lower its shelf life. – Light can destroy valuable vitamins and phytochemicals within the herb and can lower the potency of your dried herbs. Storing in a dark cupboard or closet (in my case) is a great way to seal out any ultraviolet rays. 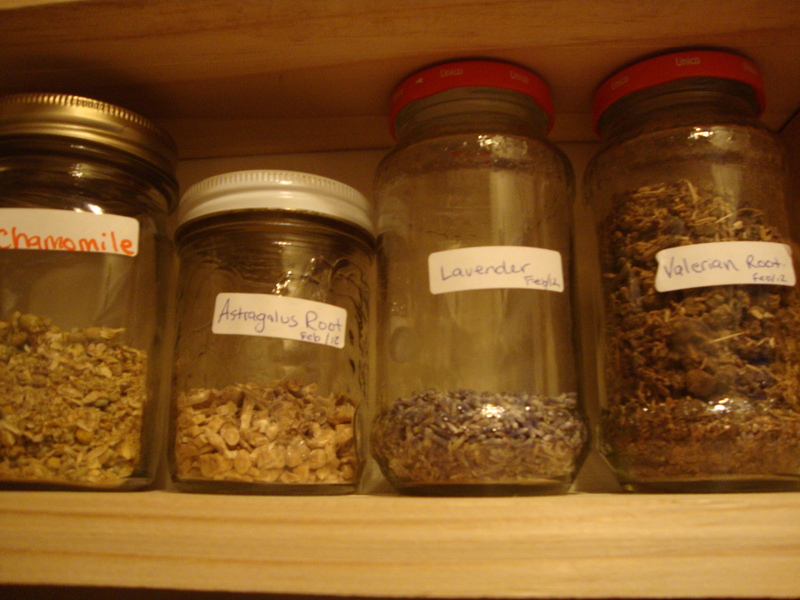 – Storing herbs away from a heat source is very important. Just like cooking your food, several enzymes and nutrients (mostly vitamins) are destroyed when heated. This also quickens their expiry date. When drying the herb, it is best to either hang or set-to-dry to reduce the exposure of heat. Another way to shorten dry-time is using an adjustable temperature dehydrator. Keeping the temperature low, and humidity low, the plant material will dry out faster with less chance of mold and will retain higher amounts of nutrients. organize it any way that you want. Some health food stores organize their herbs alphabetically for the sake of simple referencing. This is perfect for storing at home too. I like my layout to be set up in groups so if I need a few herbal ingredients to treat a certain ailment, they are all grouped together. This comes in handy when I need a little extra help with anxiety or getting to sleep, I can grab my favorite herbs from the Nervine and Sedative sections. Grouping does save a lot of time once you get to know your layout. – The way that I have the shelf set-up is that it is at head level. This way when I am am standing in front of the shelf, it is easy to see all the labels and reach everything I need. I also have a light mounted on the wall above the shelf which I can turn on when I need to see inside the dark closet. I installed a ladder on the wall to the left so I can reach the harder to access areas at the very top of the shelf. If you have the shelf near the floor you have to bend down and there is generally less light when you are trying to view labels. Since you are trying to keep sunlight out of your storage area, having a small light to see in this dark space is key. -It is a very obvious idea, but putting large and visible labels on the fronts of your containers helps to know what you have in the jar. 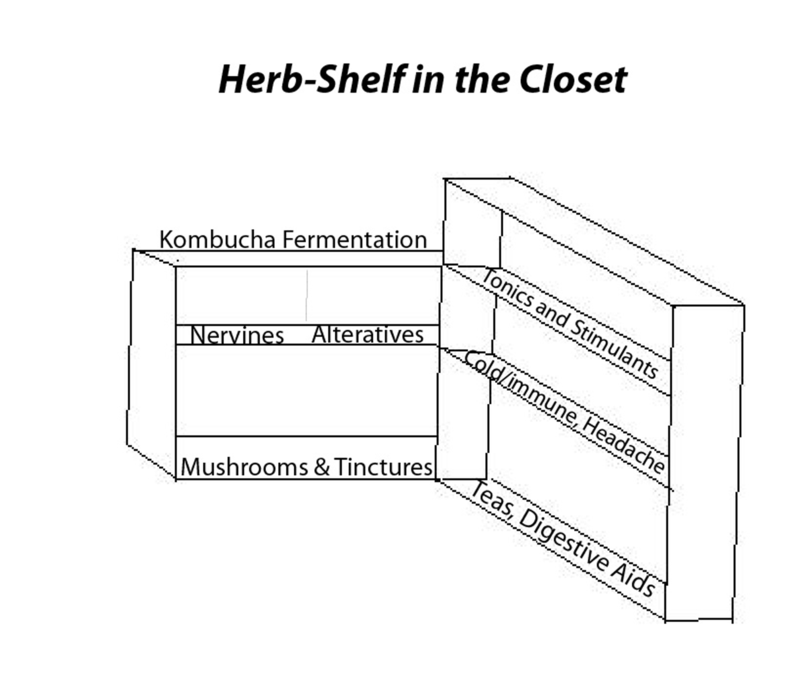 Dating helps to determine how long the herb has been on the shelf, allowing you to rotate or replace. I like to add if it is organic, sustainably harvested, or if I was the one who wildcrafted/grew the herb. I even keep my home-grown/harvested herbs in a separate container than the store bought herbs. That way I can appreciate the tastes and potency of our garden saved herbs, knowing I watched them grow and nurtured and harvested them myself – it makes the tea/remedy much more special. Color: The herb that you dry should be vibrant as the day you picked the herb. If you harvest mint leaves or lemon balm, they should be alive and green after they are dried. Herbs that are yellow/orange like Calendula should be bright and not see-through or pale. Roots hold true to this rule; they should be almost the same color and vibrancy as first harvested. Echinacea root should be a grey-brown, Yellow Dock a yellowish brown, Golden Seal should be a bright golden-green color. Smell: A good marker for quality is its smell, not necessarily a good smell, but a distinct smell that represents the herb’s quality. Some herbs are bitter, some sweet smelling, some very ‘bad’. A notorious ‘bad’ smelling herb is Valerian, having the resemblance of dirty socks. If you purchase or have Valerian stored, higher potency will accentuate a VERY dirty smelling pair of socks. This is actually a good thing… Another herb Rosemary points out is Peppermint. If you have a very good stored mint, the uncapping and smelling should make your nose tingle and eyes sting. Each herb is different, some are ‘green’ smelling, some are fragrant like flowers and pollen. Take note on the vibrancy of different brands, varieties, and suppliers, remembering the effects each herb has on your nose and senses. Taste: The power of the herb when placed on the tongue is a great indicator of the life-force and value of the plant. Again, not all herbs will have a good taste, so how much you like the herb is not the measurement. When you taste the herb it should be fresh. You should judge the potency by how strong, distinctive, and vital they are as well as how much they ‘rouse your taste buds’. Effect: The last measurement of quality and potency is to actually try the herb to see its effectiveness. We know that for much of human existence, our species has had a knowledge about plant medicine and certain plants are good for certain ailments. If your herb is not working for you, it is wise to first question its quality and potency of the herb, followed by if it is really the right remedy for the situation. When I decided to build this shelf, I did a lot of measuring and designing on AutoCAD to create a plan that fit the different sized jars and tincture bottles I had. I also took into consideration the access to the attic hatch in the closet ceiling; not to block the door. I used reclaimed wood from old shipping containers that I dismantled and planed clean and smooth. The cupboard is floating, not attached to the walls at all, just kept in place by a tight fit and 4 screws up from the main shelf it is sitting on; this way I can remove it if I wanted it elsewhere. The main dimensions are around 40″ long by 34″ wide. The shelves are double width at the bottom and single width, 4.5″ deep, at the top and on the right side. I am definitely not a carpenter by any means and this project took me about 4-6 hours to complete, not including the AutoCAD design which I made a little over-complicated for such a small shelf and simple concept. The drawing did however come in very handy for measurements and allowed me to play around with spacing before cutting any materials. A common place for people to store their culinary herbs and spices is beside or above the kitchen stove… The heat rises towards under-side of the cupboard they are stored in, potentially warming the herb. With heat can come moisture from kettles or boiling water. If herbs are not kept sealed and kept in a proper jar, they have the potential to become moldy or go bad. Moving the spices away from the stove or elements so they can maintain a cool and consistent temperature will help you keep cooking with strong, rich herbs. -Make sure if you are purchasing herbs from a store, they are sustainably harvested or certified organic. Some lower grade herb manufacturers spray their herbs with fungicides and pesticides to keep the product longer. – If you are harvesting herbs for home use, make sure you harvest them sustainably and responsibly! There is a large index available that lists herbs and plants that are over-harvested and at risk for extinction in the wild. (Some USA endangered species are listed on the USDA Natural Resources and United Plant Savers). The best way to ensure you are getting a good quality medicinal herb is to actually grow it yourself. You then know its growing conditions, its harvest date and shelf life, that it was harvested at its prime, and if there were any chemicals involved or not. 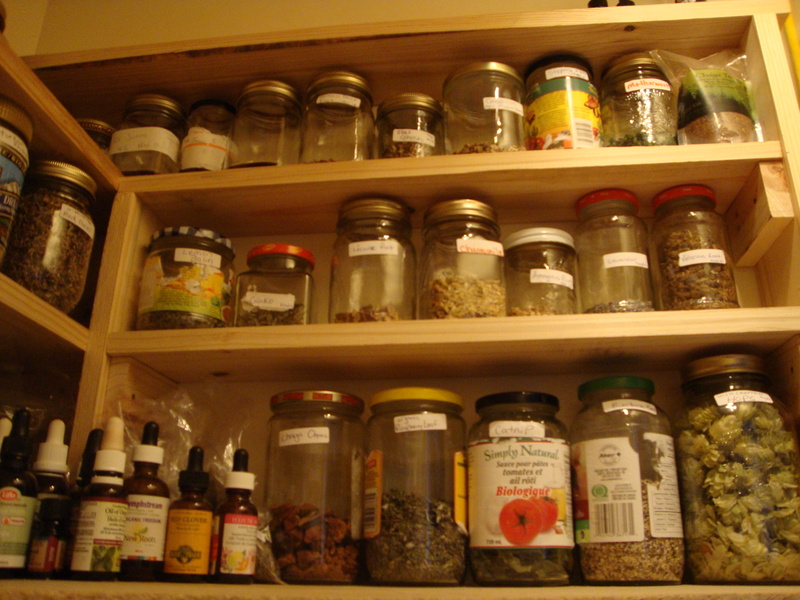 This is really cool Adam, you have acquired a very impressive and diverse collection of dried herbs and tinctures! 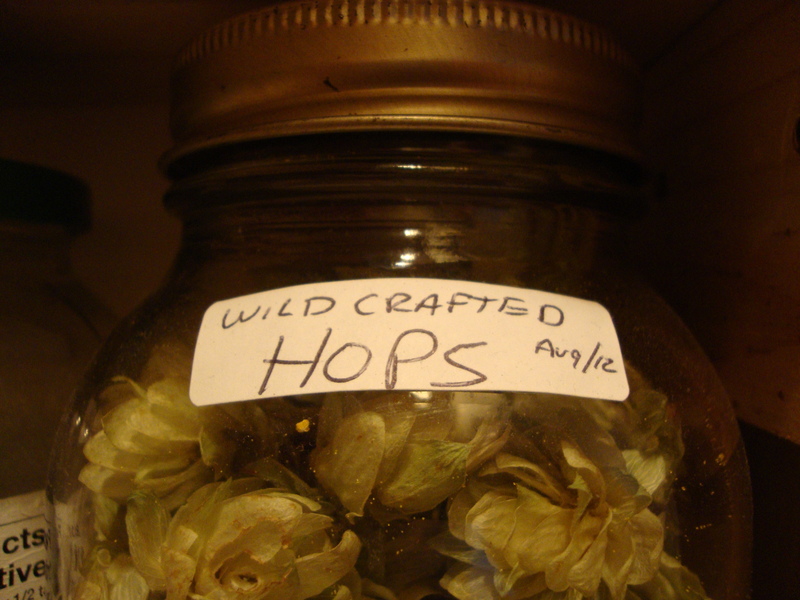 I have always used vodka (30-35% alc./vol) to make my tinctures. Is this what you use as well or have you had better success with a higher or lower percent alcohol base? Hey thanks Tom! It has been a slow and steady process but I love coming across new herbs and their uses. We started making out own Echinacea purpurea and Red clover tinctures the fall of 2011. We have been using 40% vodka as well and it seems to work really well. I have read that some plant matter/roots do better with 80-90 percent but have yet to find 90% alcohol in Canada… We have tried making a few tinctures using vinegar as the solvent; a cayenne tincture from whole cayenne peppers. It worked really well and has a pretty long shelf life too. How about you? 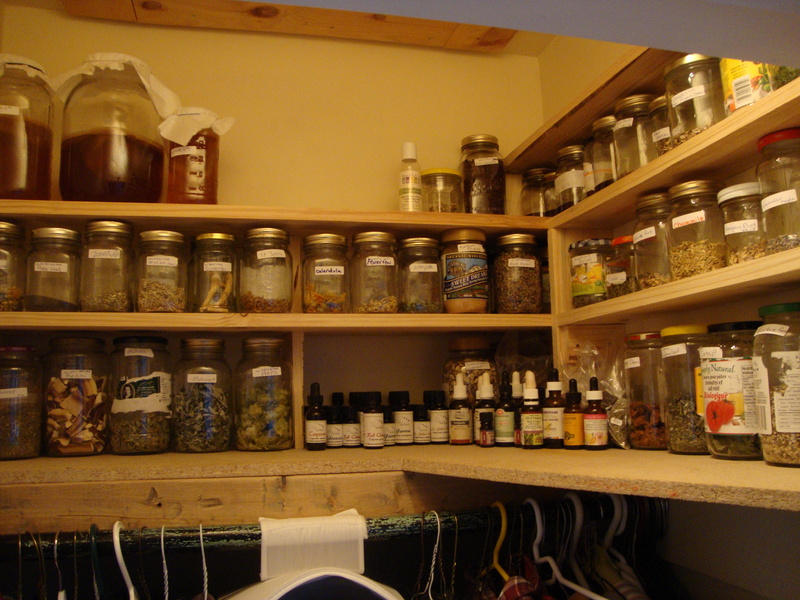 I know at your herb talk you said you had made Elecampane and others – how did those go?